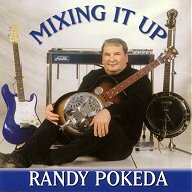 Mixing it up is an instrumental album with the pedal steel guitar as the main instrument. There is a lot of Dobro and fiddle as well. It would be classified as older style country although the Monkees hit "Daydream Believer" and Eric Clapton's "Tears in Heaven" give it a nice mix. The song "September's Heroes" is a steel guitar acapella tribute to the people of New York.